When you create a new Native & Search ad campaign, you also need to create an initial ad group. Use ad groups to drive traffic to your website and to raise brand awareness. Explore some of the topics in this section to successfully create and manage your Native & Search ad groups. How to create ad groups Describes how to test and design campaign elements, how to test bidding strategies and how to use ad groups to drive website traffic and raise brand awareness. Manage ad groups Describes how to edit, enable and delete ad groups. Ad Groups to Drive Traffic to Your Website Describes the tools and resources you need to drive traffic to your website with your ads and campaigns. Create Ad Groups to Raise Brand Awareness Describes the ad types and required assets you need to raise brand awareness for your ad campaigns. FAQs Discusses some of the most frequently asked questions when working with ad groups. Ad spend tracks the cost of a campaign and is used to calculate the ROAS metric (return on ad spend). An ad group is a set of ads and related keywords within a campaign. The ads that can be displayed to prospective customers searching for or viewing content related to advertiser keywords and/or ads. You can apply a default ad group bid to all keywords in an ad group or set custom bids for individual keywords. The description of the ad that will be shown to the user. The maximum length is 150 characters. in the user interface that include fields for name, schedule, bid strategy and average bid. An ad is an assembly of creatives and other ad details, like title, description, landing page URL, display URL, and more. Enables advertisers to target their ads to a specific set of people with whom they have already established a relationship. Audiences can be defined using Apple’s Advertising Identifier (IDFA), or Android’s advertising ID (GPADVID). Once created, these segments will be available for targeting using the TargetingAttribute service. A user will remain in an audience for 30 days from the moment their device was added, unless removed earlier using the API. Audiences from an advertiser’s website allow you to define and manage audience segments of people who have visited or have taken certain actions on your website. Once created, these segments will be available for targeting using the TargetingAttribute service. The settings in the user interface to define an advertiser audience, including locations, age, interests, and so on. An audience is a collection of consumers with similar interests, habits, or online and offline behaviors. Ads for apps are effective at prompting re-engagement. Even if users saw the ads but did not click through, they were 11% more likely to reuse the app. App users acquired with video ads have up to 43% more sessions compared to an average user. The ad landing URL is the URL where the user was redirected to upon clicking the ad. Auto reload is an option to set automatic payments for a campaign. When the campaign runs out of funds, the advertiser is charged again automatically and the campaign keeps running. An ad exchange is an ad platform that enables the sale of advertising space from publishers to advertisers through real-time bidding. A bid is the maximum amount an advertiser is willing to pay for a click (CPC) or for 1000 impressions (CPM)). A bid adjustment is the percentage or a fixed monetary amount by which to increase a bid for cases where traffic appears to be consistent with an advertiser’s selected targeting preferences. Used by advertisers to bid more competitively for certain targets. The bid limit is the maximum amount an advertiser is willing to pay for a click when campaign optimization is turned on. A bidding strategy enables an advertiser to hit a CPC goal while also driving additional conversions, or maximizing the number of conversions driven by budget to meet specific spend goals. A bid estimation is the expected amount of a bid prior to an auction. A bidded match type is the keyword specified by the bidded match type. A search that produces at least one ad (or impression) that was shown. A bucket is a group of users, defined by browser cookies (bcookie), exposed to an experience or technology. The bid amount is the maximum price an advertiser is willing to pay when one of its served ad listings experiences a user-click event. A blacklist is list of URLs that are absolutely prohibited as ad inventory on the platform for quality control reasons. Compare with whitelist, which is a list of URLs that are approved as ad inventory on the platform. Budget is the money allocated for a campaign, specified in the currency of the account, and is intended to be spent in total or on a daily basis for a specified timeframe, as indicated by the start and end dates of the campaign. A Broad Match finds all ads where the user query broadly matches the advertisers keyword. There are no syntactic requirements for a match. There do not have to be words in common, but they should have something semantically in common. The least restrictive form of matching, driven by various forms of offline analysis. A campaign contains one or more ad groups sharing the same budget, schedule, and targeting criteria. A campaign is typically created to support a particular marketing goal. The CPC (average) is the average cost per click over a selected time frame. The CPI (average) is the average cost per install value. The CPM (average) is the average cost per thousand impressions. settings of the user interface, also referred to as the campaign goal. Carousel ads present a visual story that is created by grouping up to five cards (images and captions) into a single execution. Each image that users swipe through links to a unique landing page to drive deeper user engagement. Clicks are the action that occurs when an ad is selected. The Cost Per Click (CPC) is cost of advertising divided by the number of clicks. Cost Per Completed View (CPCV) is the price an advertiser pays every time a video ad runs through to completion; rather than paying for all impressions, some of which may have been stopped before completion, and advertiser only pays for ads that finished. Click-Through Rate (CPC) is the number of clicks received divided by the number of impressions generated. Example: An ad that is displayed 100 times and receives 25 clicks has a click-through rate of 0.25. The total number of conversions, including both post-click and post-impressions. Cost Per Impressions (CPM) is the maximum amount an advertiser is willing to pay for 1,000 views of an ad. Completion is the number of impressions divided by the number of bidded searches, measured as depth - high, medium or low. The cost of acquiring a conversion (CPA) is calculated as the total cost of online marketing activities divided by the number of conversions. CPC is the cost per click over the current base bid. The cost per completed view (CPCV) is the price an advertiser pays every time a video ad runs through to completion; rather than paying for all impressions, some of which may have been stopped before completion, and advertiser only pays for ads that finished. A Call to action can be a text link, button, image, or some type of web link that entices a user to visit a landing page and take action –– for example, Shop Now. The destination URL is the landing page URL where the user will be taken to when clicking on the ad. Dot is Verizon Media’s universal tracking tag. Dot tags are used to communicate website and app events when advertisers want to track performance and optimize your Yahoo search, native and display campaigns. Dot tags also enable retargeting and advanced audience targeting for various Verizon Media channels. A system that handles the programmatic bidding and purchase of auction-based online advertising. An Exact Match finds all the ads where the user query is exactly the same as the advertiser’s keyword. For example, a user searches for “red flowers” and advertiser is bidding on “red flowers”. This is the most restrictive form of matching. A set of editorial guidelines give advertisers direction for creating ads that will help provide a quality experience for users on the Verizon Media network. Following the editorial guidelines is required in order for ads to be displayed by Verizon Media Search Marketing. Frequency capping limits how often a particular creative is served to a user – for example, no more than 3 times per 24 hours. Geographic targeting is a type of audience targeting that is based on a user’s geographic location as defined by country, state, DMA or other marketing area, and custom geographical areas. A technique for pinpointing the geographical area (address, city, state, postal code) to use for search, and thus find more relevant sponsored listings based on regions advertisers associate with their listings. A user may be associated to a location by IP address, by Keywords, by citystpc, or by hloc (home location). A technique for approximating a user’s Internet location. GDPR is a European Union (EU) regulation designed to harmonize data privacy laws across Europe that is intended to protect and empower the data privacy for all EU citizens. Verizon Media is present in the EU and subject to these regulations. Hard targeting is a form of search targeting associated with a searched-for bidded-term, when that bidded-term is retained, if it passes the evaluation for the targeting demand (for example, gender targeting). Targeting that causes an ad candidate to be kept or discarded. Image ads are ads that fit the form and function of the content around them, such as within the content stream on Verizon Media properties, apps and third-party publishers. One instance of an ad displayed on a webpage. Ad serving systems typically track impression statistics to help evaluate performance. The impression share of the advertiser within the marketplace, based on keyword level data. The 3rd-party tracking URL utilized to track impressions. Impressions are the number of views an ad receives. The total Post Click Conversions that occurred in the app after it was installed. These conversions occurred in the app, but were attributed to clicks made on an ad outside of the app, for example, a 7 day lookback window. A keyword is a token or query. It can be a word or phrase that relates to the products or services an advertiser wishes to promote or sell. When prospective customers look for information related to advertiser keywords, relevant ads may be displayed. KPI is a tool in the user interface that enables advertisers to view and customize charting data and key performance metrics for their campaigns, ads, ad groups and keywords. 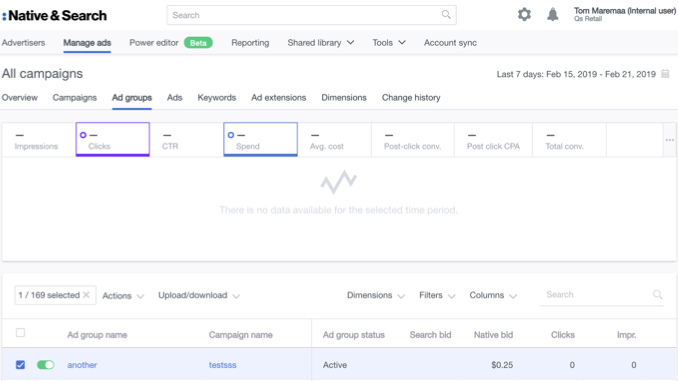 An advertiser can view hourly data for campaigns, ads and ad groups, and perform day-parting bid optimization for enhanced campaign performance. The KPI tool supports the following date ranges: Today, Yesterday, and a custom range within 24 hours. The tool supports these entities: Campaigns, Ad Group, Ad, and Keywords. Mail ads are a companion to Native ads served exclusively in Yahoo Mail. On user-click, the Yahoo Mail Ad appears in the Mail message pane, displaying as if the user had opened a marketing email from the advertiser. Users can interact with the HTML content in the message, forward it to friends and family, save it to their inbox (where it will appear with other incoming email messages), or close it without taking any other action. The search matching technology that uses a bidded-term’s match type to generate an initial set of ad candidates for a result set. Each bidded term is associated with one of these match types: Exact Match, Phrase Match, or Broad Match. MVP defines the bare minimum set of features a product needs to ship to production. Once an MVP is launched, the product can be improved in rapid iterations. Used for fast and quantitative market testing of a product or product feature. MAPPI (Mobile App Install) is the the name given to an offline pipeline and serving system dedicated to making user-level predictions of click and conversions for mobile app install ads. MAPPI is integrated with native serving as an external ranking service and used to make predictions for all incoming requests on mobile phone and tablet having a mobile device id. Negative keywords are search terms you may want to prevent from being used to match to the ads in your account. The excluded words feature lets you refine your matching by blocking words that you believe are not relevant to your products or services. This can help keep your ad relevant to searchers. Native Ads have the look and feel of the content around it as well as are contextually and personally relevant to the user. Native video ads are clickable video ads that fit the form and function of the content around them, like the content stream on Verizon Media properties, apps, and third-party publishers. Typically, native video ads will drive a 50% lift in brand favorability and 28% lift in purchase intent. oCPC (Optimized CPC) is a performance pricing feature, best used if an advertiser is concerned about CPA (Cost Per Acquistion), but not any other metric. Based on the conversion prediction, oCPC will automatically work out the bid (instead of using a fixed maximum bid) in the auction to optimize for conversion. oCPC performs well on mature advertising accounts that have extensive conversion data. The model can work out a more accurate conversion prediction, given more historical data. Finds all ads where the user query is a contiguous subset of the the advertiser’s keyword. For example, a user search for “red tea roses” will match for an advertiser keywords “red tea roses”, “deep red tea roses”, “red tea roses with white”, and “deep red tea roses with white”. A conversion that takes place after a users has viewed the ad. A conversion that takes place after a user has clicked on the ad. A conversion that takes place after a user has viewed the ad. A product feed, also known as a product catalog, is a data file that consists of an advertisers’ product information, leveraged by any commerce advertiser across verticals, like Retail, Travel and Auto. Real-time bidding (RTB) is the process of using demand-side platforms (DSPs) to bid automatically, in real-time for ad impressions. The bidding occurs in the fractions of a second between the time a user clicks an ad and lands on its corresponding landing page. Return On Ad Spend is the revenue (conversion value) divided by ad spend. ROAS will calculate the ROIs that are returned for each campaign, according to the Conversion Value that the advertiser provides via their Dot tag instrumentation. A Return on Investment is a performance measure used to evaluate the efficiency and profitability of an investment, or to compare the efficiency and profitability of multiple investments. The formula for ROI is: Gain from Investment minus Cost of Investment, all divided by Cost of Investment. The result is expressed as a percentage or ratio. retargeting is a form of behavioral search targeting employed by online marketers and used to target an audience based on users’ previous searches across websites. This allows an advertiser to target users who have visited (or not visited) their website and performed (or not performed) some action on that website. SoN (Search on Native) is a feature that uses Search demand to serve ads in Native ad serving. This enables advertisers to drive more traffic and maximize the impact of their search campaigns by targeting customers who have searched for their products on native inventory, thus extending the reach of campaigns. In the context of programmatic advertising, the SSP is the publisher for the DSP. to their products or services. Ads can appear in search results when people enter a search term related to a keyword. Tiles ads are an ad format optimized for mobile that loads instantly with videos, images, and text and is designed to communicate an advertiser message in a portrait format that is natural, engaging, and immediate.